One of my co-workers keeps asking me to bring brownies in to work, but I've resisted thus far. Because...brownies? Not much of a challenge there - you can get some pretty good ones with 30 minutes and a box mix. 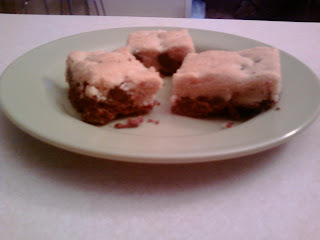 So when I stumbled across these double decker brownies, I knew I had to make them for the office. 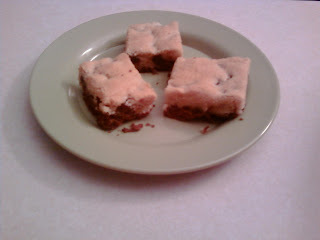 The recipe starts out with two pretty simple batters: one brownie-like and one blondie-like. Lucky for me, the recipe called for three egg whites - the exact amount I had left from making the lemon drop cookies before! Things are just working out this week. 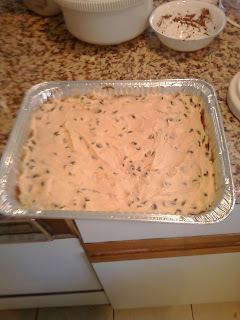 The top, blondie layer, calls for M&Ms to be mixed in, but I went with chocolate chips instead. This is another one of those recipes where a multitude of mix-ins could be used. First I spread the brownies bottom in the greased pan, and then the blondie on top. I suppose you could switch them around if you wanted as well. 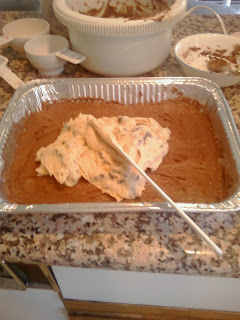 The top layer was a little harder to spread without disturbing the brownie underneath, but it was doable. If you didn't know better, you'd never even know about that secret layer of brownies underneath. Until you cut into them of course. On of my coworkers renamed these interracial brownies. I'm all for diversity, so make these now! Truth is, while these were good, they were not great. And it's all my fault. See I left these in the oven a wee bit too long, and they ended up more like cake than brownie. But cake is good too. I didn't take them for about 34 minutes, but I would recommend not going over 30. Tip of the Day: While you can buy many different tools to separate eggs, I still think the best one out there is the shell itself. Just crack it open, and catch the yolk in one half, and pour it back and forth until fully separated. You might not get it the first time, but practice makes perfect! Cream butter and sugars together. Beat in vanilla, egg whites and whole egg. Gradually add 2 1/4 cups flour, baking powder and salt. Divide batter in half. To half of dough add mixed melted butter and cocoa, spread evenly into a 9x13" baking pan. 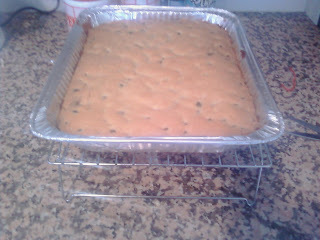 To the other half, stir in 1/4 cup flour and 3/4 cup M&M’S or chocolate chips. Spread over chocolate mixture. Bake on 375F for 25 to 30 minutes or until edges start to pull away from sides of pan. YUM - 2 treats in 1!! Your co-workers are so lucky!! That is the way Mom taught us to seperate eggs. I was surprised one day to learn that you could buy and egg seperater! Congratulations on six months! I need to come over and learn how to bake soon! Leftover Egg Whites = Meringues!